Minister of Agriculture, Forestry and Fisheries Tina Joemat-Pettersson, in her infinite wisdom, has decided that the best way to turn around the performance of the Marine and Coastal Management Unit is to relocate it to Pretoria from Cape Town where it is currently based. Exactly how taking a coastal management unit away from the coast will help is difficult to fathom. Talk about a fish out of water. Do we need to remind Minister Joemat-Pettersson that 80% of commercial fishing activity takes place in the coastal region of the Western Cape? Does she expect fishermen to travel to Pretoria each time they have to apply for a permit? And what will happen to the 7 00 Marine and Coastal Management staff members who currently reside in Cape Town? This has clearly not been thought through properly. • the awarding of an R800 million tender to Sekunjalo Consortium, which was clearly incapable of doing the job, but whose directors are politically connected. The Department of Agriculture, Forestry and Fisheries is clearly in chaos. Our scarce marine resources, which provide a livelihood for thousands of people, cannot be allowed to dissipate just because of one Minister’s unwillingness or inability to lead. Fisheries should move to Pretoria! The Minister of Fisheries proposed yesterday in Parliament that the Fisheries Branch which has always been located in Cape Town be moved to Pretoria! Apparently she thinks that fisheries considers itself a provincial function of sorts and not a national function! Had the minister of fisheries remotely understood fisheries, she would know that more than 80% of all commercial fishing activity happens in the Western Cape! Or did I miss something and do we land fish in Gauteng these days? More than 90% of all recreational fishing takes place in the Western Cape. Minister, please explain to us how on earth will fishery managers regulate and manage fisheries from Pretoria? How will liaison and co-ordination with the fishing industry (which is based in the Western Cape, by the way, minister) take place? How will the scientific and management working group meetings take place with the fishing industry? How will compliance be regulated on the slipways and landings sites? How will administration take place. In any case, all permit applications and other regulatory matters have to take place in person in Cape Town at the offices of the Fisheries Branch. This requires fishermen in any case to travel from the Southern Cape coast, West Coast, Eastern Cape and Northern Cape to Cape Town to hand in applications or appoint Cape Town based consultants to lodge applications on their behalf. Will fishermen have to travel to Pretoria each time they have to make a fishing permit application or apply for export permits. We issue 3000 fishing permits annually and more than 12000 export permits annually. The last time I checked, there were no fisheries experts and administrative consultants based in Pretoria! Will managers fly down to Cape Town 20 times a month and stay at five star hotels? Will you relocate all 700 staff from Cape Town to Pretoria? It is frightening how this woman repeatedly spews out nonsense on such a consistent basis! It is inconceivable and an indictment on us that we allow such levels of idiocy and utter stupidity to govern us. Minister! Do us all a favour and resign. WHAT NOW THAT THE SEKUNJALO TENDER BONANZA HAS BEEN CANCELLED? So what does the Minister and her department do now (besides wipe more egg from their collective faces) that the Sekunjalo tender has been withdrawn/cancelled/trashed? One option of course is that the tender invitation gets a make-over and potential service providers submit fresh tenders. Another option would be to actually make use our Navy! Since the procurement of the infamous Corvettes, the Navy has been extremely interested in assisting with combatting IUU fishing on behalf of the Fisheries Branch. The Navy surely has the skills and resources to manage, maintain and deploy our fisheries patrol and research vessels? In addition to providing the professional skills to man our vessels, their management of our vessels could also serve a broader coast-guard function, combatting piracy and the growing drug-trade by sea. Not to mention that the Fisheries Department could immediately save a ton of money (or a billion to be more precise)! 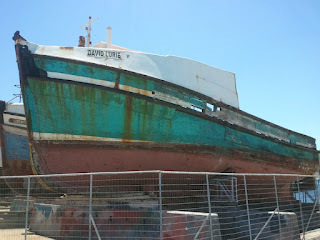 On 27 November 2011, Feike published an article on this BLOG questioning how, just two days previously, the Minister of Fisheries could have conceivably allocated an R800 million vessel management and maintenance tender to Sekunjalo Investments, which owns Premier Fishing. Premier Fishing holds a range of extremely substantial fishing quotas in a number of South Africa’s largest and most lucrative fishing sectors. Premier Fishing, for example, is the single largest holder of South Coast rock lobster fishing quotas. We questioned how it was possible that a fishing company could be granted a tender to oversee fisheries compliance patrols and fisheries research. The shocking conflict of interest was plain for all to see except Sekunjalo and the Minister. On 26 November 2011, the Mail & Guardian published a separate and unrelated story about Premier Fishing’s decision to pay for the personal security costs of another Cabinet Minister. Soon thereafter, the Democratic Alliance, together with a host of media, repeatedly highlighted the clear conflict of interest the tender allocation created. By December, the incumbent service provider, Smit Amandla, had begun legal proceedings against both the Minister and Sekunjalo seeking to interdict the Minister from proceeding to implement her decision to allocate the tender to Sekunjalo. There was no evidence that the bid adjudication committee even considered the major conflict of interest in awarding a contract to Sekunjalo. The qualifications of the people on the committee also could not be verified. The report acknowledges the apparent conflict of interest, repetitively raised by the public. Premier Fishing, Premier Fishing Consortium and Sekunjalo Marine Services all submitted bids for the same tender, citing one common annual report as their supporting documentation. The fact is the forensic report, coupled with the interdict application (which Sekunjalo failed to even oppose) would require too many difficult (if not impossible) questions to be answered. However, a number of very difficult questions remain to be answered publicly by the Minister. For example, who were the members of the evaluation committee; what were their technical skills and qualifications to adjudicate such a complex tender; have they and their family members been subjected to lifestyle audits before and after the adjudication of the tender; what role did the Minister and officials in her department play in this debacle; why did Sekunjalo effectively submit three tenders for the same bid and what were each of these bid amounts; why did the Minister rush to announce the decision when the forensic report highlighted these significant concerns? The Sekunjalo tender debacle once again exposes a department and Minister lost at sea. Perhaps we need to be reminded that an ANC member of the Fisheries Parliamentary Portfolio Committee has described this department as being “dysfunctional”. On the 23rd of February 2012, almost three years since its arrest, the High Court of the Republic of Tanzania delivered its verdict in the case of the fishing vessel Tawariq 1; guilty. The Court ordered the vessel to be forfeited to the Government. The Captain of the fishing vessel, Mr. Hsu Chin Tai and the ship’s agent Mr. Zhao Hanquing were found guilty of fishing without a licence in the Tanzanian Exclusive Economic Zone (EEZ). They have been sentenced to pay 1 billion Tanzanian shillings each (USD 625,975) or go to jail for twenty years. The Captain was also fined a further of 20 billion Tanzanian shillings (USD 12,519,500) for the offence of pollution. On the 8th of March 2009, the Tawariq 1, supposedly registered to Oman, was intercepted 180 nautical miles off the Tanzanian coast, and subsequently arrested by a South African Environmental Protection vessel EPV Sarah Baartman. The vessel had no flag visible or hoisted, the radar was switched off, no license or permit was produced and no port of registry was provided. Multiple names were found on the vessel. The name No.68 Bu Young was found embossed on the port and starboard bows as well as on the stern of the vessel and at the upper part of the wheel house. The name Tawariq was painted over the name Buyoung in several places on the hull. Life-rings, the service record of one of the life-rafts and other documents indicated the name of a Korean fishing vessel, namely No.11 Insung. The vessel that uses long-lines, was caught with more than 200 tonnes of fresh and frozen tuna on board. The statement below was issued to day by the Democratic Alliance. The DA welcomes the withdrawal of the tainted R800 million tender allocated to Sekunjalo Marine Services Consortium. The tender was for policing South Africa’s marine resources. The DA has been fighting for justice on this matter for the last four months. The Department’s decision to withdraw the tender was based on a legal opinion and forensics report that I exposed in a letter to the media published on Friday morning. The tender was revoked that afternoon. It is important now that the withdrawal of the tender must not divert from the serious questions that now have to be asked about the bid adjudication process in the department. The DA calls on Minister Tina Joemat-Petterssen to ensure that public finance law is followed in all respects. Those responsible for causing this conflict of interest by awarding the tender must be held responsible. Should the Minister fail to do so, the DA will take steps to involve the Public Protector, Thuli Madonsela, and Auditor-General, Mr Nombembe, in determining who is responsible for this. A forensic report in the DA’s possession exposes bias on behalf of members of the committee in the bid adjudication process. Irregularities of this kind have far reaching effects for South Africans. The livelihoods of thousands of South Africans are threatened by government’s mismanagement of our marine resources. Disciplinary procedures or criminal charges must be instituted against officials to ensure accountability and to prevent future irregularities and negligence. The awarding of the infamous ‘Sekunjalo tender’ was announced in November last year, but Smit Amandla Marine, the previous contract holders, took the Department of Agriculture, Forestry and Fisheries to court, thereby stalling the process. The forensic report notes an apparent conflict of interest, given that the Sekunjalo Consortium would be patrolling marine resources being fished by their subsidiary company. Premier Fishing has been granted a large portion of fishing quotas. The company also submitted a bid, citing the same financial statements as Sekunjalo. Feike understands that the tainted R800 million fisheries tender bonanza allocated to Sekunjalo has now been withdrawn and will be re-advertised. Who Should be in Charge of our Fishing Harbours? Section 27(1) of the Marine Living Resources Act of 1998 (“the MLRA”) provides for the Minister of Fisheries to proclaim a harbour a “fishing harbour”. Since promulgation of the MLRA in 1998, the Fisheries Minister has not proclaimed any harbour to be a fishing harbour. All 12 of the current fishing harbours were proclaimed prior to the promulgation of the MLRA. Section 26(1) of the Sea Fisheries Act, 12 of 1988, made identical provision for the declaration of fishing harbours. Although the two sections of the two Acts are identical, the MLRA was promulgated subsequent to the adoption of the Constitution of the Republic of South Africa in 1996. The Sea Fisheries Act was promulgated in an era of Parliamentary sovereignty and not Constitutional supremacy. Schedule 4 (Part B) of the Constitution lists the regulation of, inter alia, pontoons, ferries, jetties, piers and harbours, excluding the regulation of international and national shipping and matters related thereto, as being a local government function. International and national shipping does not take place in any of the fishing harbours. Fishing harbours are exclusively limited to recreational and fishing boat activities. Given the parlous state of our fishing harbours caused by the increasing lack of resources available to the national department of fisheries, it is a most opportune time to seriously lobby for fishing harbour management and control to be handed to those local government authorities capable of managing the 12 fishing harbours. Where the local authority lacks the resources to manage a fishing harbour under its jurisdiction, section 155 of the Constitution places the obligation on the provincial government concerned to manage the harbour in question. The inability by the national department of fisheries to properly and efficiently manage our fishing harbours has a direct and adverse impact on local tourism, crime, grime and general infrastructure decay. We have focussed on Hout Bay Harbour to date, which is the largest and most important of the fishing harbours but it is in a shocking state of neglect and now a preferred thoroughfare for abalone and lobster poaching; the harbour is littered with abandoned and sunken vessels; crime within the harbour is so rife that unprotected vessels are stripped bare overnight; many of the fish processing buildings stand vacant and look derelict. It is just sensible that local development plans (focussing on local economic opportunities, job creation, tourism etc) will best complement and support any regeneration strategy for the fishing harbours and communities adjacent to them. The fisheries department’s 3rd quarter report bizarrely states that it intends to increase the number of proclaimed fishing harbours from 12 to 19. The names of the possible additional 7 harbours are not mentioned. Why they would want to increase the number of proclaimed fishing harbours is not explained. The only logical reason is that they could at least be seen to be doing something. But other than that there is no logic to this. Our fishing harbours are in a disastrous state. 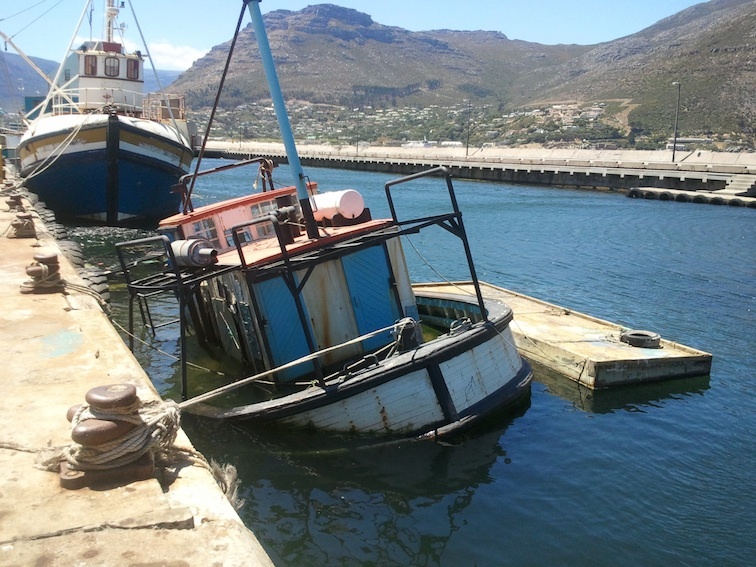 DAFF continues to fail to invoice users of the harbours; security is non-existent and harbours like Hout Bay pose a serious threat to safety and security. 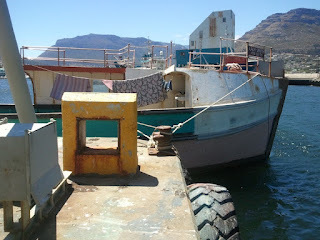 Hout Bay is now a very convenient thoroughfare for abalone and lobster poaching with rubber ducks landing their illegal catches in broad daylight near the repair jetty. They then leisurely load their illegal take onto vans which are parked not more than a 150 metres from the fishery control offices and off they drive right past a completely inebriated DAFF employee who is supposed to function as some sort of access control officer to the Harbour! In 2007, DAFF’s forerunner, the department of Environmental Affairs’ Marine and Coastal Management Branch, commissioned a report on the state of the harbours and remedial measures. The report cost multiple of millions and was kept secret. Feike has however secured access to the report (and will provide access to whoever wants it). It is clear that the report was never read (or understood) as none of its recommendations have been implemented. 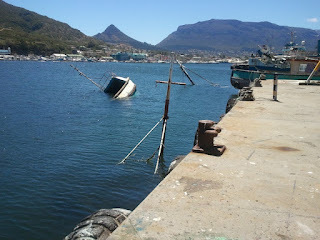 A week ago, Feike took these pictures showing about 8 sunken vessels in the Hout Bay Repair Jetty area. These wrecks have been here for years with some wrecks actually resting on top of others below. As a result, less than 20% of the quay space is available in the Jetty Area and not a single boat (whether sunken or not) pays any fees to DAFF. The only functional and relatively safe berthing areas in the entire harbour are those managed and controlled by private interests, including the Hout Bay Yacht Club. An abandoned and rotting David Lurie takes up valuable repair space on the slip. An abandoned vessel at the repair jetty now being used as a squatter area. There are at least three sunken vessels in this view. The Fisheries Minister and the Director-General of the Department of Agriculture, Forestry and Fisheries (DAFF) failed to turn up this morning to brief the Parliamentary Portfolio Committee on Fisheries. They apparently failed to even submit formal apologies or explanations for their tardiness. Members of the Portfolio Committee were extremely agitated. Mr Abram, MP (ANC), led the charge describing the DAFF as being a “dysfunctional” department full of “Hollywood actors” referring to the vast numbers of officials who simply “act” in posts and that its Minister and DG are disrespectful of the Committee. He charged further that the documents prepared by the DAFF officials are woeful; that they actually belong in the rubbish bin; and that they contain a lot of information that simply does not exist in reality. The meeting was postponed to Thursday afternoon. As a taxpayer, I must say thank-you to our so-called fisheries minister and her over-paid DG for wasting more of our money. She does nothing else.